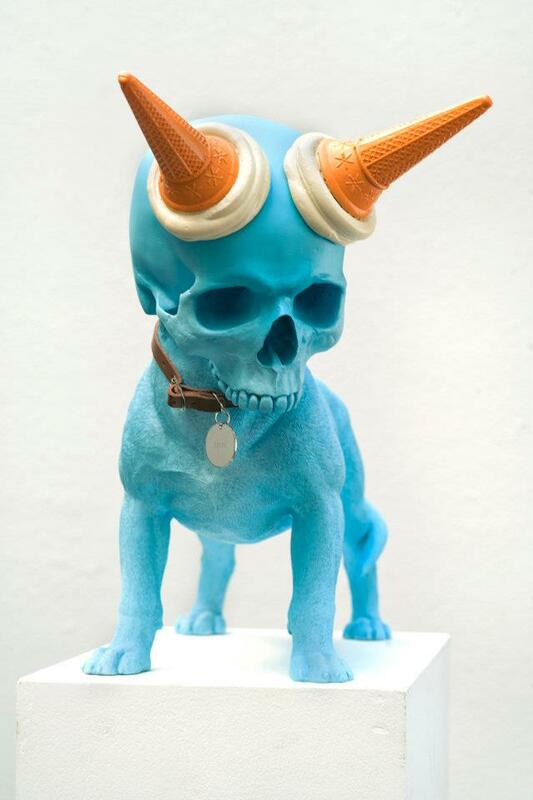 Mickael Alacoque’s Sculptural Works present a Playful, Colourful and Eccentric Aesthetic. 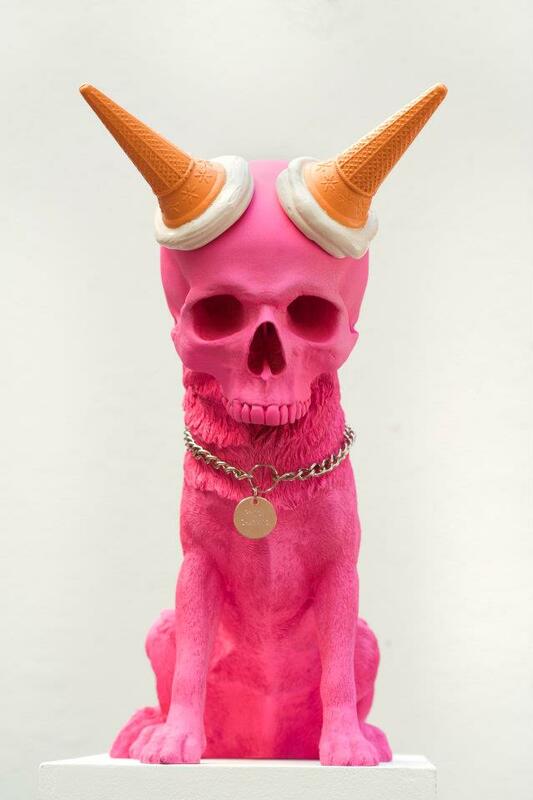 I remember feeling that overwhelming sense of bewilderment as I continued to stare at this pink, fluorescent statue with the two ice-cream cones protruding from the forehead of the skull. Alacoque’s Prince Charming features quite an obscure appearance, although the work features a high level of detail and intricacy that is combined with an element of spontaneity. Alacoque obscures the way the ‘public statue’ is interpreted or examined within society and the sculptural works present quite a unique, imaginative style through the use of bright, fluorescent colours and textures. 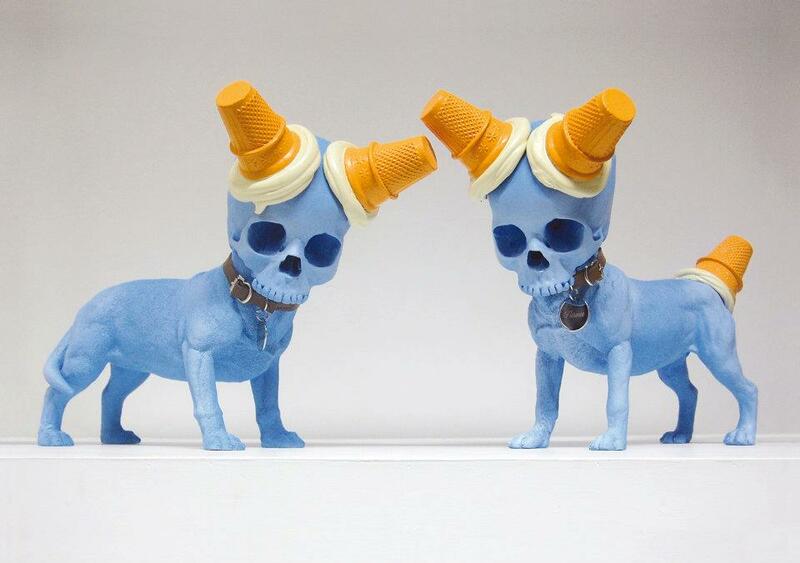 The melting ice-cream cones, the grimacing skull and the canine’s body feature a refined, yet detailed structure that are combined in order to create a completely different meaning or interpretation all together. These sculptures in particular are often described as unsettling when they are viewed up close, however I don’t necessarily find them disturbing, in fact I find the Bad Babysitter series rather amusing or entertaining. From a personal perspective, the compositional elements present a playful, humorous and satirical disposition that successfully provide quite a memorable impression. If you are interested in Alacoque’s eccentric works, I would recommend visiting the links listed below for further details. 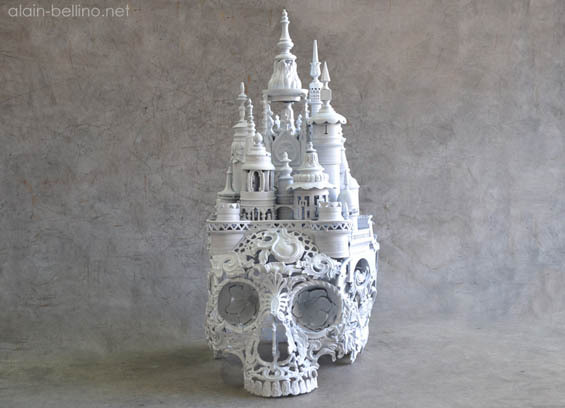 Yesterday, I discovered the works of Alain Bellino, an artist / sculptor based in France who has successfully transformed a range of antiques and ornaments into these magnificent three-dimensional skulls. At first, I was immediately impressed by the level of detail and craftsmanship; Bellino’s sophisticated, yet perplexing designs provide a unique approach towards sculpting and metal restoration. 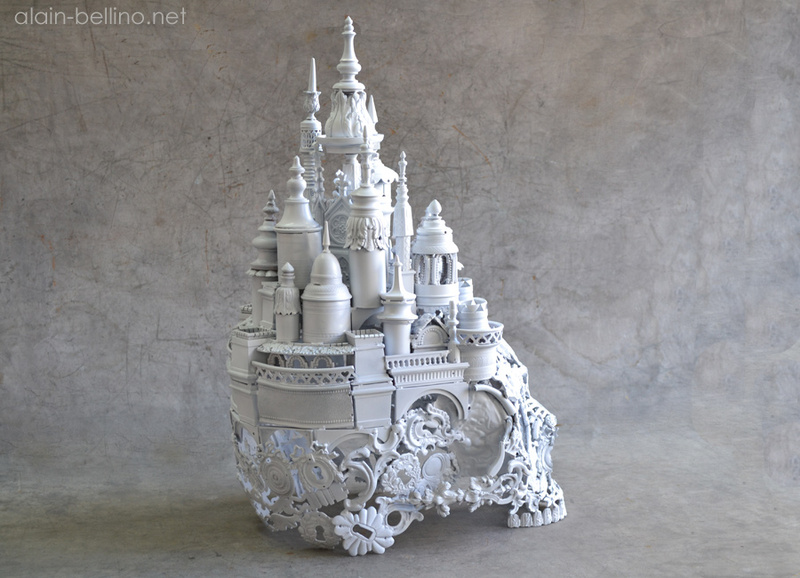 According to Bellino’s Behance website, the artist initially explored ornamentation and metal restoration in the 1980’s; Bellino applies these intricate materials with his own distinctive style in order to create a series of extraordinary, yet imaginative works of art. The Renaissance period and the Vanitas have inspired the artist’s work that successfully combines a traditional European style with a modern, contemporary design. Bellino meticulously wields certain metals including Bronze, Silver and Gold in order to create a collection of inspiring, three-dimensional works, as referenced by the artist’s Behance site. There are two works in particular that immediately captured my attention, the first one features a delicately, hand-crafted skull that features a range of creative, eclectic designs. The sculpture also features a castle that is attached to the very top of the skull; now this particular element is remarkably impressive to say the least! I decided to view the image from a closer perspective and the skull is constructed from a range of floral patterns and designs; from a personal perspective Bellino’s sculpture successfully explores the concept of death. While the idea of fatality is imminent within Bellino’s work, the sculpture itself doesn’t necessarily feature a grim or grotesque representation. This is just my own interpretation anyway, I’m sure there are plenty of other meanings associated with this particular work. 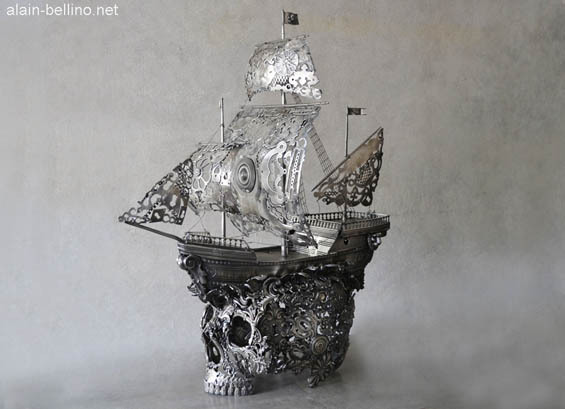 Voyage is another fabulous sculpture produced by Bellino that features a detailed, intricate ship along with a silvery, monochromatic skull. The work is rather surreal and the detail is phenomenal, viewing this particular sculpture in person would be an incredible experience. Every time I view the skull, I recognise something different or something I never even realised before. Take the key holes for instance, I never even recognised this fine detail until I decided to view the work for the second time, Voyage always has something unique to offer to the audience. One could argue that Bellino’s Voyage, demonstrates the artist’s fascination with Renaissance art that is combined with a series of unusual designs. I can’t possibly imagine how long it would have taken Bellino to produce this particular work, it would be very interesting to find out! 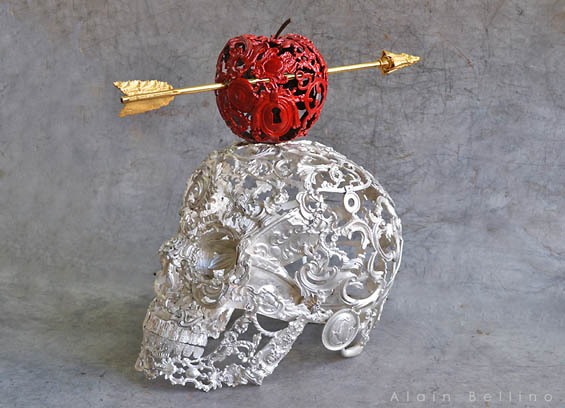 Now I have mentioned two particular works that I have found inspiring, however I have recently discovered another image featuring a golden arrow impaling a bright, red apple that are both placed onto the top of a metallic skull. The colours significantly contrast with one another and the apple becomes a strong focal point; each individual detail delivers a very unique element that is almost impossible to forget! As you can see, Alain Bellino has created some fabulous works, if you are interested in viewing the artist’s portfolio, click on the links below for further information. Justina Bakutyte has written a very interesting article in regards to the works of Alain Bellino that is definitely worth reading, just check out the link below. 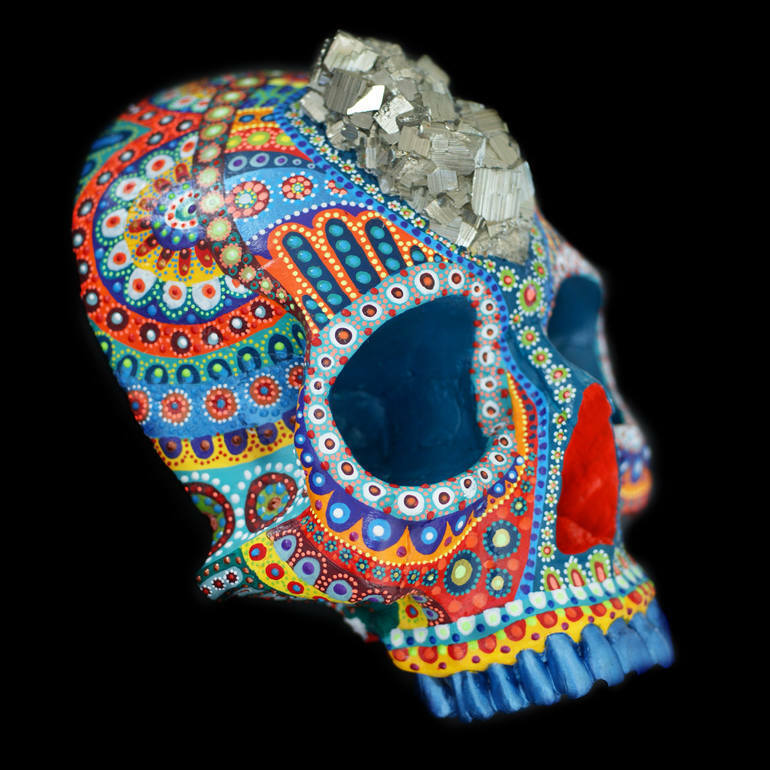 While I was browsing through the internet, I discovered the works of Marie-Pascale Gautheron, a contemporary artist based in Paris who creates a series of hand crafted skulls with delicate, vibrant and intricate designs. Every minuscule detail is highlighted through a combination of bold colours or decorative patterns that compliments the shape and the contour of the skull. 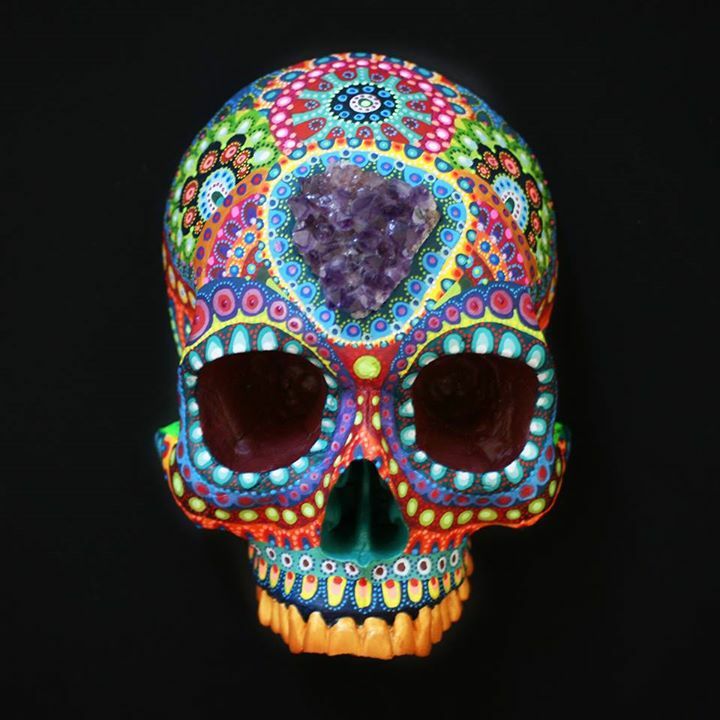 These sculptural works in particular reminded me of the Mexican Day of the Dead Celebration and the sugar skulls, however these quirky designs feature a unique, psychedelic twist. In regards to the Skull Appreciation Society, Gautheron uses the skull as a visual art form that are either drawn or hand painted and I was immediately intrigued by the high level of craftsmanship. As I continued to browse through Gautheron’s online portfolio, I discovered a series of neon skulls and the paint successfully creates a very interesting, yet surreal effect. I decided to ask Gautheron about these delicate neon skulls and the artist explained that the works feature a “special paint that reacts to light.” This is definitely a fascinating method / process that instantly invites the viewer to take a closer look at the works. These skulls in particular are quite different to anything I have seen before and Gautheron uses the skull frequently throughout her work in order to create a series of decorative and artistic murals. From a personal perspective, these eclectic skulls portray the concept of death and mortality in a positive, cheerful manner through the combination of vibrant colours and innovative designs. 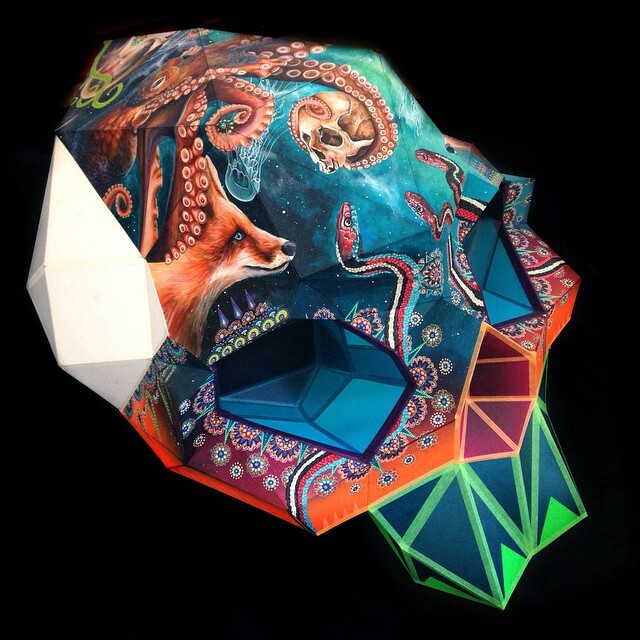 There is another sculptural project that immediately captured my attention, Gautheron has constructed a skull from paper that features a highly detailed, realistic aesthetic; the work itself delivers so many different interpretations that successfully invites the audience to view the skull from another angle or perspective. The skull features a drawing of an octopus holding a skull with its tentacles; this is rather interesting as the skull features a smaller image of a skull. This is quite a clever concept / idea and Gautheron’s work delivers a surreal, yet fascinating experience. If you are interested in skulls or contemporary art, I would highly recommend visiting the artist’s website, Facebook, Twitter or Instagram page. The Skull Appreciation Society also features a very interesting article in regards to the works of Marie-Pascale Gautheron that is definitely worth viewing! During Christmas Sean and myself received some interesting gifts, over the past few weeks I have been particularly fascinated with this new ceramic skull that has been sitting on top of the desk in the study room for the past few weeks. The skull features a range of patterns and designs that also provides quite an interesting effect and the colours compliment with the actual base of the skull. In fact the patterns are quite unique and the dark eye sockets do appear sinister, in fact the skull appears to be grinning. 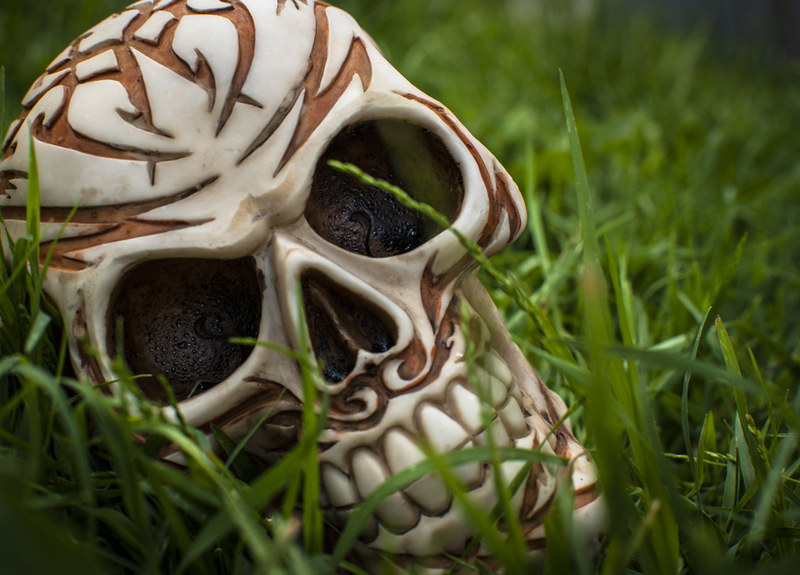 So a couple of weeks ago, I was taking photographs of Sean’s work for a portfolio, I also decided to take some shots of the ceramic skull. 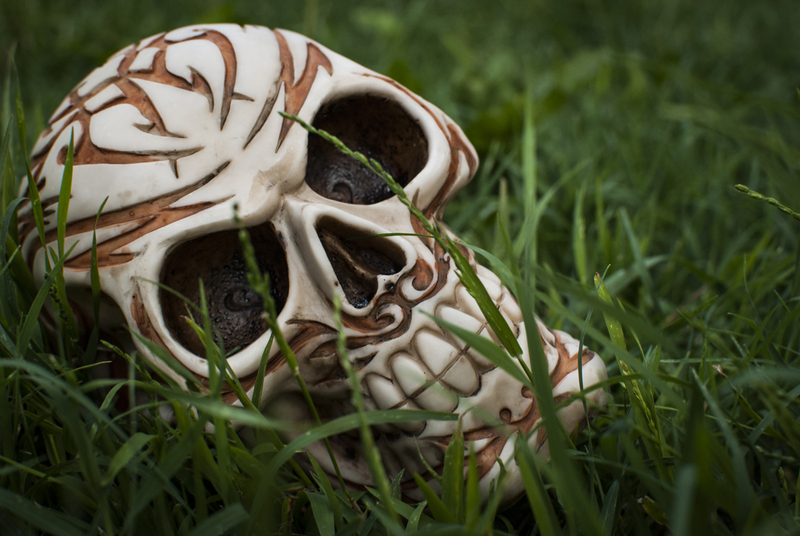 The bright green grass compliments the patterns and designs on the very front of the skull. The overgrown grass also distorts the actual shape of the skull, I thought this particular effect was particularly interesting. I’m hoping these photos will provide some new ideas in the next upcoming weeks. Thats all for now, stay tuned for future updates. 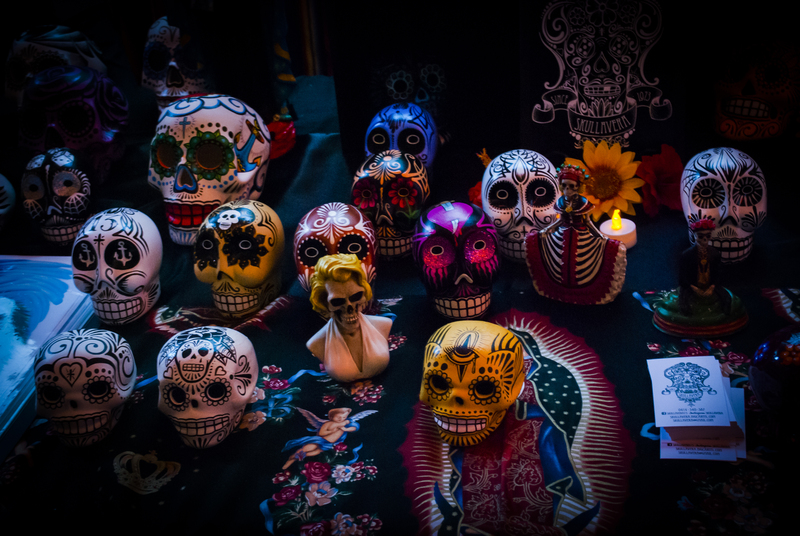 Last Saturday, I attended a Day of the Dead Celebration in Melbourne that featured a range of hand crafted skulls, printed t-shirts, altars, traditional Aztec dancing, Mexican street food and face painting! 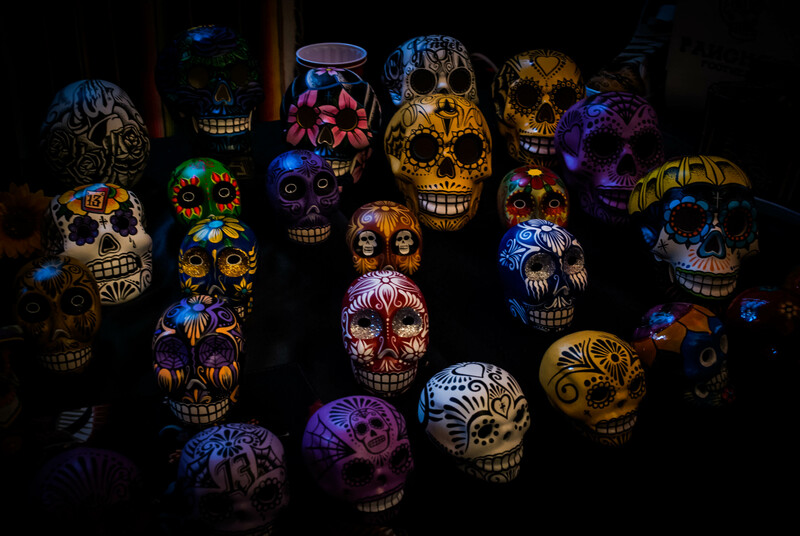 The event was located at the Trust Bar and Restaurant in Flinders street that was full of visitors with their faces painted as the Mexican sugar skulls, it was fascinating as there were so many different patterns and designs! It was interesting to see how each person had interpreted the Mexican sugar skulls, some had used colourful face paint while others had decided to go with a minimalist approach. Furthermore, I did find the event particularly fascinating as I have never been to a Day of the Dead festival in Melbourne and the event was quite different to what I was expecting! At first the venue was rather crowded, although I throughly enjoyed watching visitors passing by with their sugar skull face paint! As I was walking through the venue, there was one stall that had captured my attention. 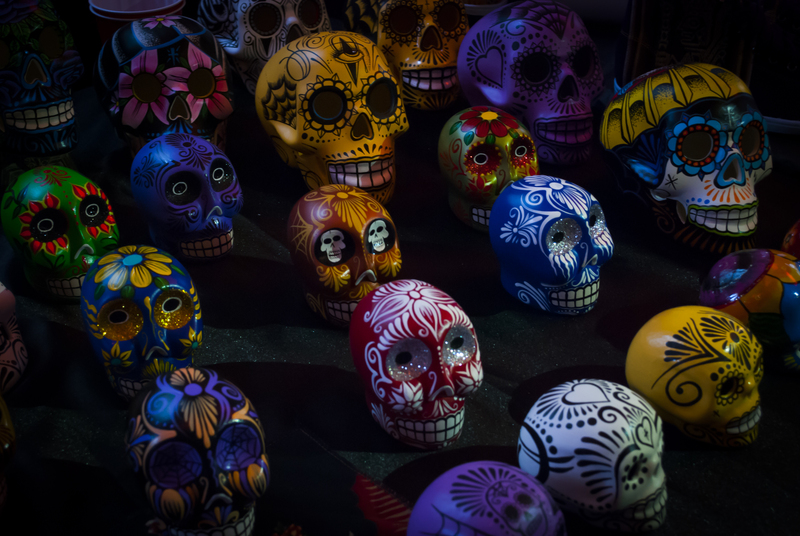 There were a range of colourful and illustrative skulls that were displayed onto a wooden surface along with a selection of skeletal figurines including Frida Kahlo and Marlyin Monroe. These hand crafted skulls featured elaborate and decorative designs that are quite unique compared to the other ceramic skulls that I have seen throughout the city of Melbourne. These incredible hand crafted skulls are produced by a company known as Skullavera that is currently based in Sydney, Australia. BME Melbourne have conducted an interview with the artist who explains that the skulls are inspired by Chicano / latino tattoo designs as well as “the Mexican Drug Cartels.” 1 Each skull features a completely different style, there were so many different patterns, designs and illustrations, in fact the stall at the Day of the Dead celebration was definitely vibrant and decorative. 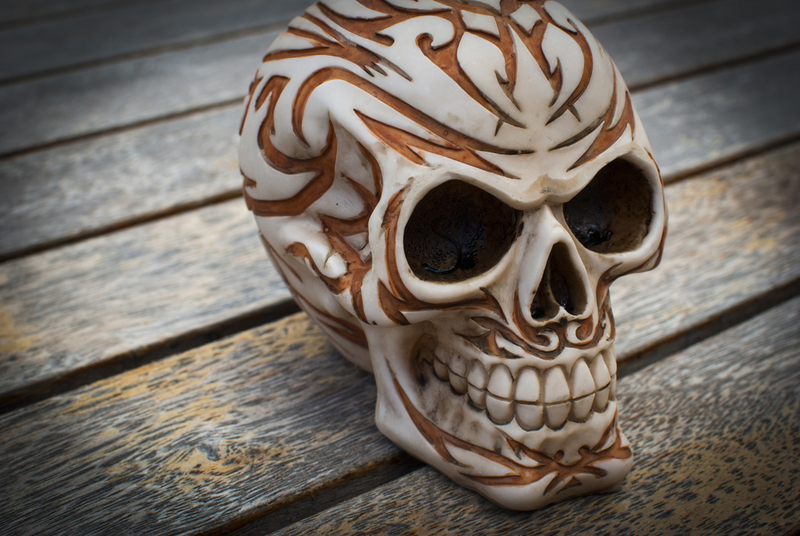 In a way, the artist applies a unique and distinctive style to the ceramic skulls, the level of detail and craftsmanship is incredible! The illustrations provides each skull with a unique characteristic, these models appear to have an individual personality, a personal style! While there were bright and colourful designs available, there were other skulls that featured a range of black and while illustrations, the stall at the Day of the Dead Celebration in Melbourne featured some extraordinary ceramic skulls in all different shapes and sizes, I was seriously tempted to buy one for myself! 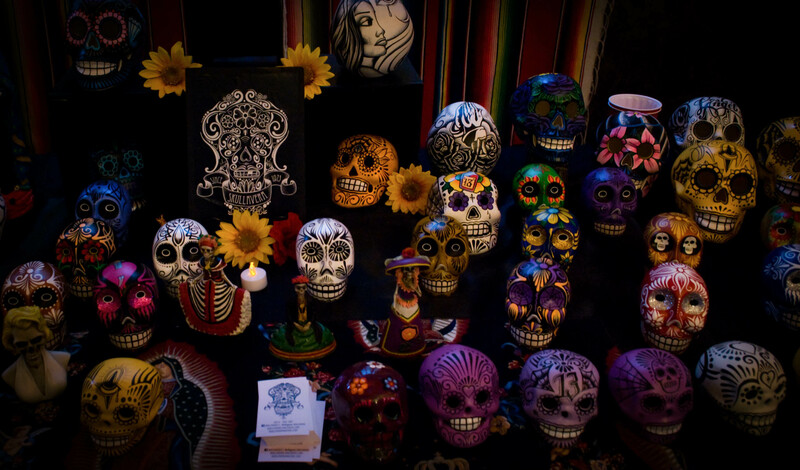 In fact the display in general was creative and inspiring, it was seriously hard to walk past the stall without taking a dozen photos, I was in awe for at least 30 minutes, I just could not take my eyes off these hand crafted skulls! I f you haven’t seen Skullavera’s work, then I would strongly suggest to visit the Facebook page or the blog, there is some incredible work displayed online. For those who have never even heard of this Day of the Dead Celebration in Melbourne, I would recommend buying a ticket for next year! 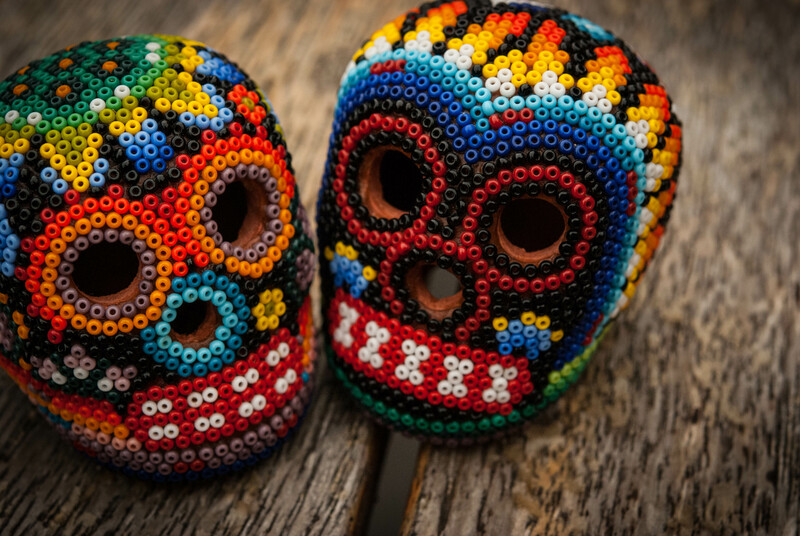 As if you can go wrong with beer, tequila, nachos and ceramic skulls all in the same venue? While the event itself was crowded to begin with, the works on display were definitely worth seeing! Today a friend of mine posted a very interesting article onto my Facebook page, the photo was enough to capture my attention! 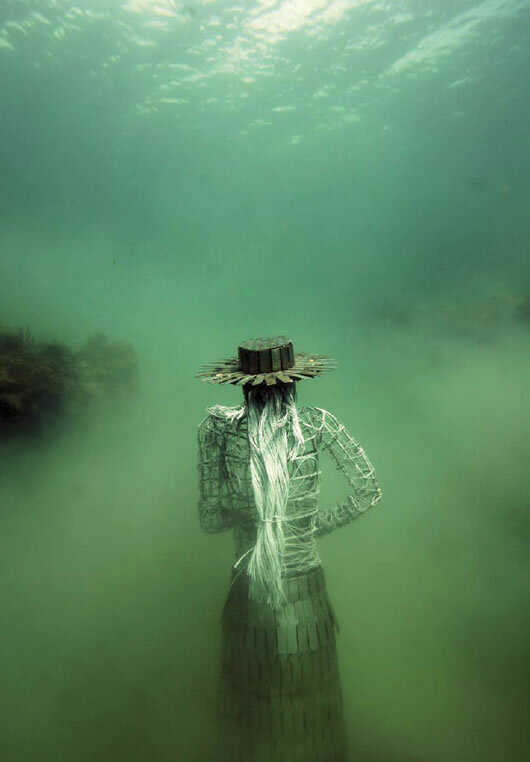 Freelance writer, David Elliot explores a range of spectacular underwater sculptures produced by artist, Jason deCaires Taylor. 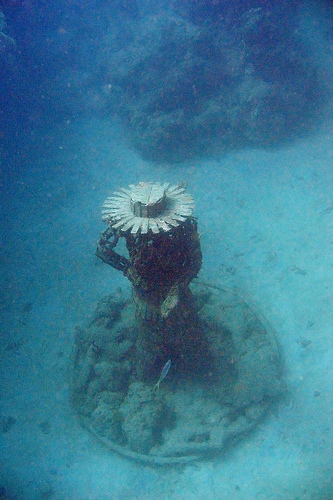 In Grenada, visitors are invited to go scuba diving in order to view these three dimensional sculptures, this is by far the most unique idea / concept I have heard of! In a way, Taylor is using the natural environment as an exhibition space, where visitors have to psychically submerge themselves into the Caribbean waters in order to witness Taylor’s unique body of work. According to Elliot, the artist’s collection features a range of unusual figures that depict ancient “Grenadian folklore”, although there was one sculpture that immediately captured my attention. Elliot’s article features a photograph of ‘La Diablesse’, an uncanny female figure with a brimmed hat and a skeletal face, there is something quite unsettling about this particular figure, especially the dark eye sockets and the unusual facial expressions that provide quite a sinister appearance. Even the name sounds sinister and the figure reminds me of something you would normally see in a horror film! The victims finally witness the woman’s true appearance that is far from what they were expecting, instead they are faced with something rather deadly! 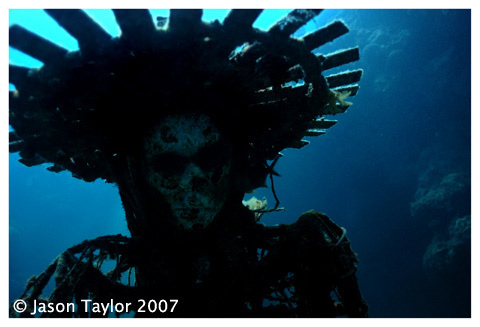 Illes also mentions that ‘La Diablesse’ resembles certain characteristics to the human skull, I can see some of these ideas / concepts portrayed within Caire’s underwater sculpture! Taylor’s version of ‘La Diablesse’ does remind me of the human skull, especially the figure’s pale facial complexion, the dark eye sockets and the jawline. The photograph is quite extraordinary, the blue and green hues also provide a rather interesting effect! The skeletal frame contrasts with the figure’s pale, ghostly face and the artist has chosen the perfect location for this particular sculpture. The ocean does provide a sense of isolation and disembodiment that also adds to the figure’s dark and sinister nature! So I often wonder how the artist creates these underwater sculptures? Creating a sculpture is quite a challenging task, creating an underwater sculpture is taking things to a whole new level! I suppose the actual creation / production will remain a mystery, although I would definitely love to visit these sculptures one day. I would definitely recommend reading Elliots article or visit Jason deCaires Taylor’s website, the photographs will definitely inspiring and captivating! 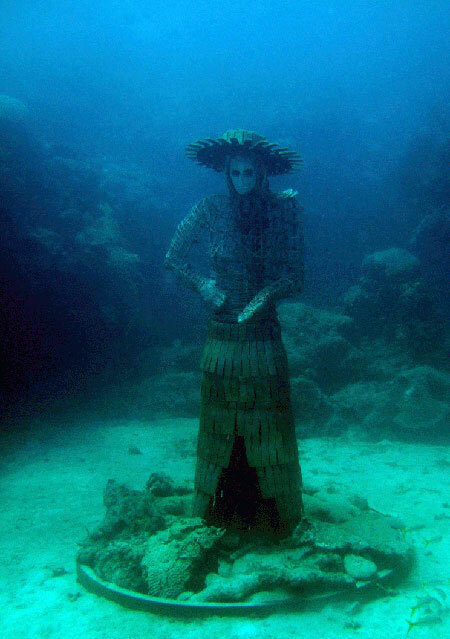 Hey if your feeling adventurous you could even visit the sculptures in Grenada, that would be a visit of a life time! On the day of my birthday, I received two small gifts from an authentic day of the dead store in Melbourne called Amor Y Locura. On the 22nd of September, I received two beaded skulls that feature intricate patterns and designs, the skulls were imported from Mexico and there were only two left in Australia, how how lucky is that?! 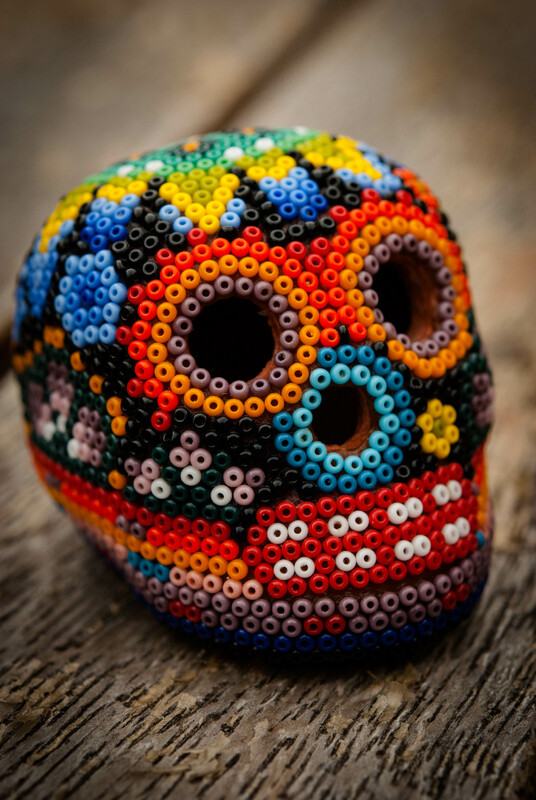 While visiting the Day of the Dead store in Melbourne, I was amazed by the two large beaded skulls on the very bottom shelf, the level of craftsmanship is remarkable! 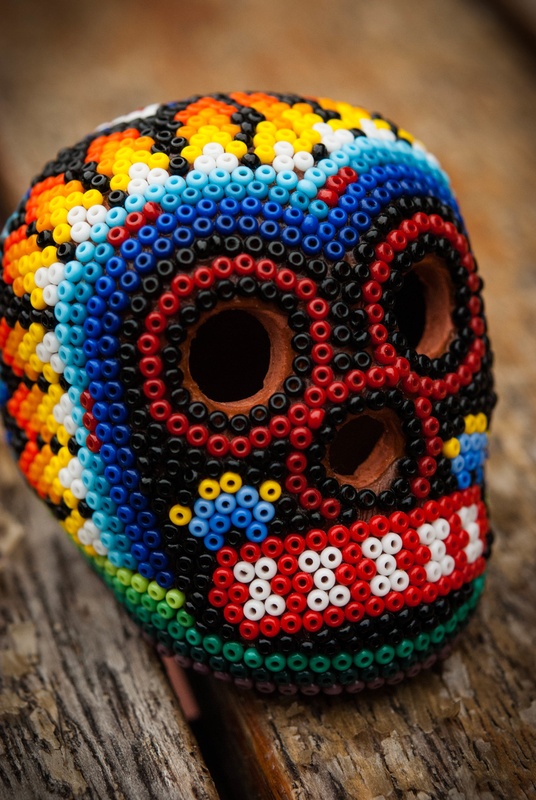 A customer within the store had advised me that these colourful beaded ornaments are also known as the huichol skull, I must admit I was intrigued by the name so I decided to undertake some online research. According to Lynne Bairstow, Huichol Art derives from many ancient traditions and rituals that were commonly practised amongst the aztecs. Bairstow explains that the patterns and the designs found in Huichol Art represent nature, these beaded sculptures often contain a strong association to various animals and plants. In comparison Harald Prins and Dana Walrath in Cultural Anthroplogy: The Human Challenge also comment on the extraordinary designs found within Huichol art that also refer to the values and beliefs practised amongst the indigenous communities within Mexico. Prins and Walrath refer to Schaeffer & Furst in People of the Peyote : Huichol Indian History, Religion and Survival, both authors explain that these particular designs refer to a “sacred plant” in Mexico also known as the “peyote”. The indigenous communities in Mexico also associated this particular plant with a deer that would deliver important messages to many of the “gods and goddesses”. It’s quite fascinating to actually discover that all of these designs have such a strong meaning / signification; these beaded sculptures certainly reflect Mexico’s cultural and spiritual heritage! So what else did I discover? Well, I also discovered the works of Catherine Martin who was also inspired by Huichol art during her trip to Mexico, Martin has also spoken directly to some of the tribes who create these exquisite sculptures. According to LN-CC, Martin collaborates with these ancient tribes in order to produce colourful, vibrant and remarkable designs! This is a very unique idea as I’ve never really seen too many artists or designers appropriate the Huichol beaded sculptures, in fact I’ve never even heard of Huichol art until I visited the Day of the Dead store in Melbourne. I decided to take some photographs of the beaded skulls out in the backyard; I do find the patterns and designs particularly fascinating! The beads create a gradient around the eye sockets, the nose and the mouth, this also creates quite an interesting effect. Some of the patterns do resemble plants, animals and even flames that are located around the edge of the skull. In a way the patterns remind me of an abstract landscape painting as strange as it sounds! The skull to the right has green along the bottom and the blue around the eye sockets reminds me of a river streaming along a field or a mountain; on the other hand, the white, orange and yellow remind me of a rising sunset. 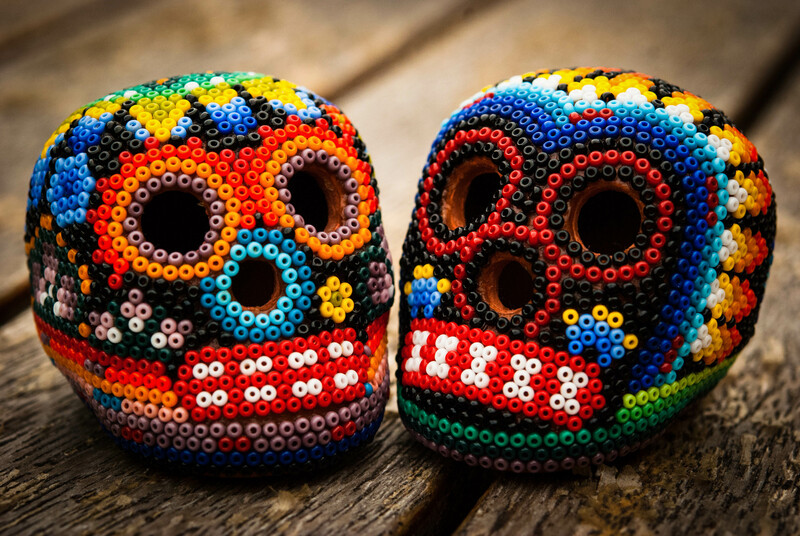 I suppose there would be various meanings and interpretations in relation to the beaded skulls, I must admit these sculptures do appear bright and colourful in the front living room, in fact they make fantastic ornaments for the house! 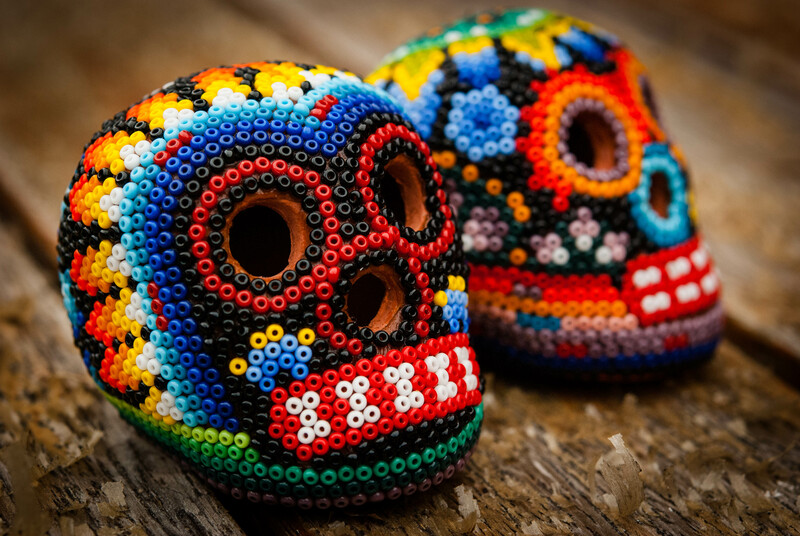 So if you haven’t seen one of these beaded skulls before, I would definitely recommend visiting Amor Y Locura in Melbourne, Fitzory. 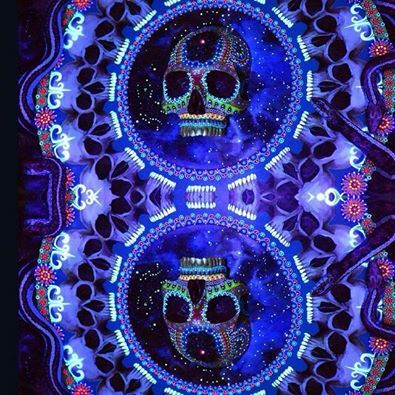 It’s definitely worth the visit, especially if you would like to see these exquisite Huichol Skulls in the flesh!